DESCRIPTION: UNIBASE is a low viscosity, highly penetrating, advanced acrylic polymer adhesive and primer that develops a tenacious bond to existing roof substrates. It was designed to penetrate and adhere reinforcement fabrics where required, as well as act as a bonding primer to enhance the adhesion of Roof Mate topcoats over built-up, modified bitumen, wood, concrete or previously coated surfaces. 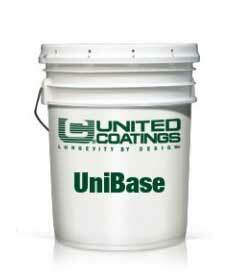 UNIBASE forms a flexible, waterproof base for applying the Roof Mate finish coats. It is an easy to apply, cost effective method of securing reinforcing fabric over surfaces prone to structural movement, allowing the stress to be distributed over a broader area of the roof coating system. It also wets into existing substrates or existing coatings to lock down residual dust or contamination, thereby maximizing adhesion of the subsequent acrylic topcoat. UNIBASE also blocks the migration of asphaltic oils, so that the Roof Mate finish coats can be applied without risk of the bleed-through problems often associated with conventional roof coating systems. Color is translucent green. Dries with a light tack. Roof Mate HT, High Tensile Elastomeric Roof Coating, WHITE color. Meets ASTM D6083. Energy Star and CCRC Listed. 5-Gallon Bucket. Price/Bucket.